Hydrogen fires can damage objects in the vicinity through heat fluxes transmitted by radiation and convection. Water spray or mist should be used to attenuate radiant heat from a hydrogen flame. Since hydrogen is colorless, odorless, burns with a nearly invisible flame (especially during daylight hours), and gives off relatively little radiant heat, a hydrogen fire is often difficult to detect. Thermal imaging cameras and flame detectors should be used to verify that a hydrogen flame is present. If these tools are not available, personnel should cautiously approach a suspected leak and watch for thermal waves that signal the presence of a flame, and put flammable objects or dust particles into the flame to emit in the visible spectrum. Although hydrogen fires do not produce smoke themselves, burning of nearby combustible materials can result in smoke. 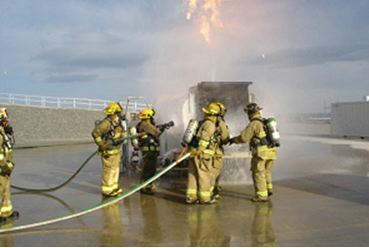 Thus, personnel should be aware that smoke inhalation can be a danger in a hydrogen fire.